It didn’t take me long to rethink how to look at Shakespeare texts after listening to Dr. Ann Cook Calhoun compare them to a musical score. 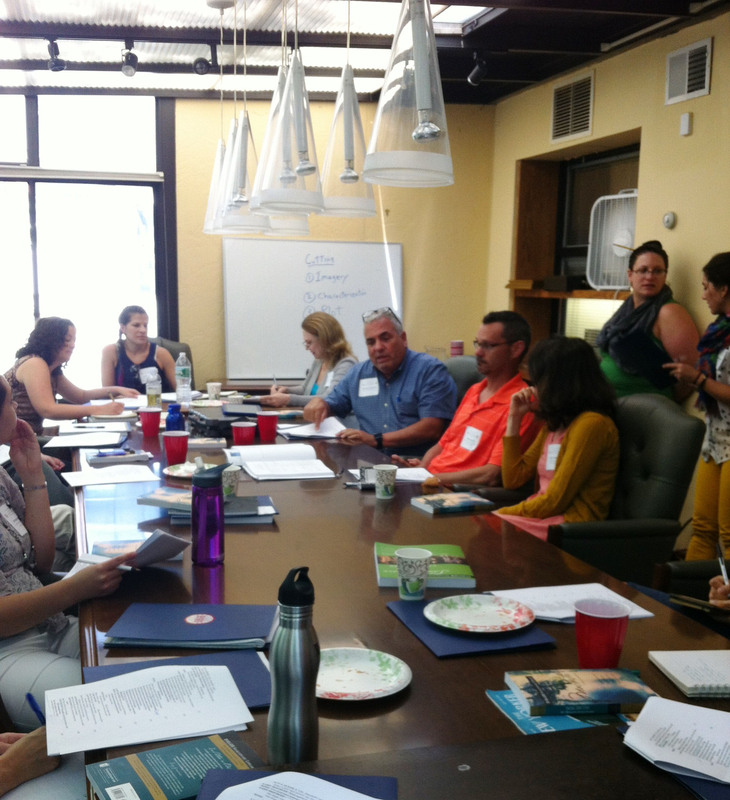 “Reading texts sitting at a desk is like looking at musical notations without hearing the instruments” she said during the English-Speaking Union’s Shakespeare Teacher Intensive two-day, low-cost, non-residential institutes for teachers. She went on to explain the performative nature of Shakespeare texts, which essentially serve as scripts. The idea behind the intensive institutes is to present a unique teaching methodology designed to help teachers put students “inside the texts, and get the words up on their feet.” Dr. Calhoun’s message was clear, not only did I need to “play” the “music” in front of me, but also its meanings and beauty would be much louder and clearer with other “musicians” around to discuss the meaning, and then perform the score. The workshops aren’t just lectures presenting nifty ideas either. The English-Speaking Union has partnered with the Folger Shakespeare Library, which provides a master teacher to present curriculum ideas using a variety of methods, most of which are included in the Shakespeare Set Free Toolkit teachers can take home with them. The Toolkit includes a flash drive with handouts, cut scenes, images from the Folger collection, 10-30 minute performance-ready versions of some of the plays, and a copy of Shakespeare Set Free, Teaching Romeo and Juliet, A Midsummer Night’s Dream, and Macbeth. 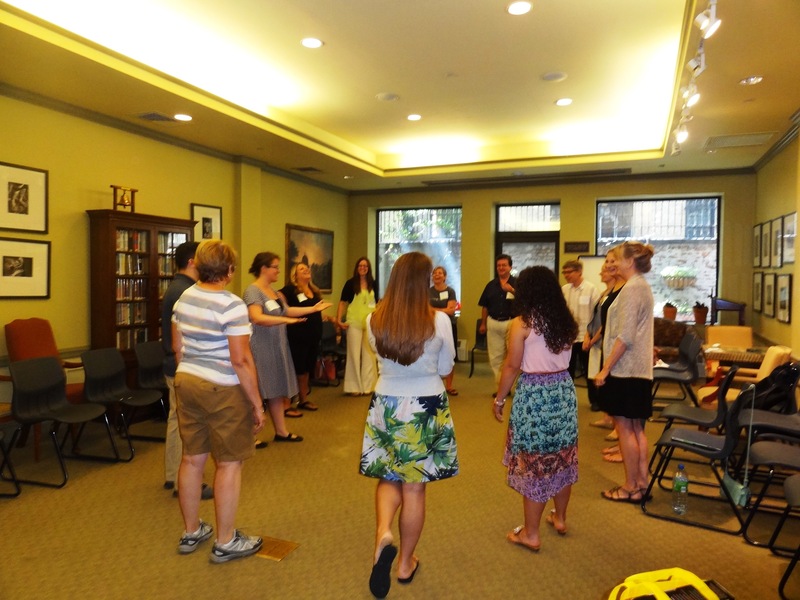 Not only does the workshop create a collegial atmosphere among the teachers in attendance–sure everyone is there voluntarily, even paid to be there–but the workshop also allows a teacher to recreate the collegial atmosphere with students in his or her own classroom on two levels – scholarly and practically. One scholarly lesson I employ in my classroom comes directly from a lecture from Gail Kern Paster, former director of the Folger Shakespeare Library. Her lecture dealt with the Humours – the Elizabethan physiological understanding of the bodily fluids and how their balance affects human emotional states. Her lecture has allowed me to address, naturally and in context of the play, Elizabethan belief systems as they come up in the texts; Hamlet, for example, when his “melancholy” is addressed. I am now able to enlighten my students to questions they bring up themselves instead of forcing information on them which only I may find interesting. When students see their peers engaging the text and asking questions and getting answers, they tend to be more responsive as well as inquisitive, providing a far more logical approach to teaching students about Elizabethan England. Over the two days, I worked and performed with teachers from around the country, of different levels and from both public and private schools. We worked together first in cutting, then performing our scenes to the group. It wasn’t just two days of lectures; I was given access to lessons and exercises I could apply immediately and confidently in my classroom. It was two days of learning how we can make Shakespeare far less intimidating and far more fun in our classrooms every time we pass out a text to our students. Since I attended the workshop, I’ve frequently heard from my students “I never had so much fun learning Shakespeare before” and “Hamlet was my favorite work we did this year.” I always smile, because it never gets old hearing it. For more information and registration you can go to the ESU’s Website. Michael Klein teaches twelfth grade honors and AP Literature at Sachem High School North on Long Island in Lake Ronkonkoma, NY. He is a 2008 Teaching Shakespeare Institute (TSI) alum and has been involved in the FSL/ESU Shakespeare Set Free workshops since 2010. He teaches four Shakespeare plays a year – Hamlet, King Lear, Much Ado About Nothing, and A Midsummer Night’s Dream.